Tim Price is a composer and clarinetist who specialises in contemporary-classical music and film scores. Tim’s music has been part of a number of events on the Island, including The Manx Passion (for the Island of Culture year) and the 120th Anniversary celebrations for the Snaefell Mountain Railway, as well as several independent films and animations. Tim studied music at Bangor University in North Wales, achieving a First class BMus degree in 2012, followed by MA (Distinction) in Music (specialising in Composing Film Music). 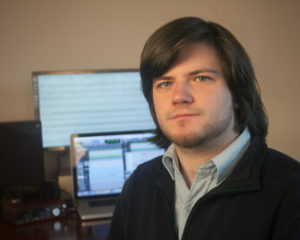 His experience studying Welsh composers has encouraged him to explore new approaches to composing music with Manx connections.